First let me say… I had never pictured myself as a doggie-mom who made her pampered pooch their own food on a daily basis. But if you’re smart about packaging up a big batch of this dog food in one-day-use-portions, then your pup’s meal time can be a quick and easy experience for couple of months. I stumbled upon, and adapted, this recipe from Rachael Ray’s September 2009 magazine article titled: Meat-Me-in-the-Backyard Hash. 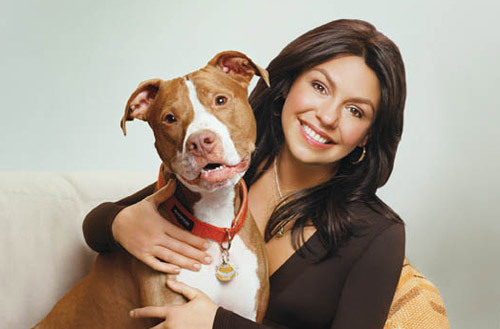 (CLICK FOR THE LINK) If you don’t already know… Rachael Ray, is a huge dog lover! She regularly includes dog treats and dog food recipes in her magazines. For you big dog owners out there looking for a one-time ‘treat’ for your dog, the link above is a fun recipe to make up for a one-time portion. It’s also great for a trial run for us small dog owners to see if your Fido likes it or not – but they WILL! 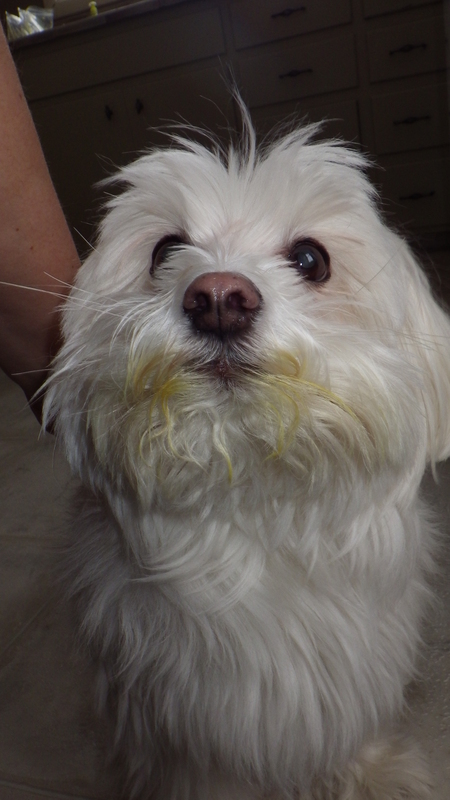 Mitzie now licks her lips when I ask her IF she wants “Supper” – such a cute habit! After I tested this recipe out on Mitzie, I then made a triple batch, and experimented with freezing it. 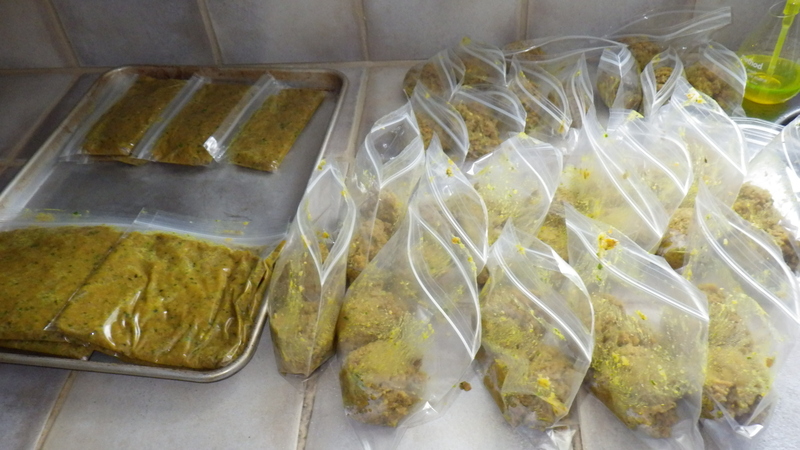 I ran the cooked product through my Food Processor, and froze her daily meals (2-3 heaping tablespoons) in about 28-30 resealable snack-sized bags. To stock up on this recipe for a month or more (your little pup WILL love you for it! ), I suggest you follow my recipe, which I have “Up-Sized” SIX times from the recipe link above. I hope that my tips also help guide you in your endeavour to make the very best food you can for your furry friend. TIP: Just wash, do not peel, the vegetables or apples. Save your time as there are great nutrients in the peels! extra-lean ground beef, or turkey. 1. Process/ shred all your fresh ingredients (excluding the parsley), and mix them together with the oil. 2. Place the shredded mixture in a Turkey Roaster. Cover and place in a 350*F pre-heated oven for about 20-30 minutes, stirring thoroughly every 10 minutes. 3. While that is roasting, saute the ground beef in a large frying pan or stock pot, and add the turmeric. Stir constantly until cooked thoroughly. Do not drain. 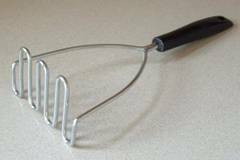 TIP: I like to use a potato masher to break up the meat at the beginning. Thank you Rachael Ray for that great tip! 4. Once the veggies and meat are done, combine them together, and mix in the 12 tablespoons of fresh chopped parsley – it’s good for their breath. 5. 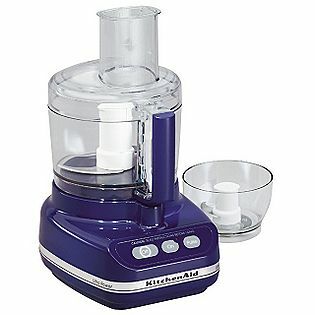 Process the dog food in small batches through your Food Processor. 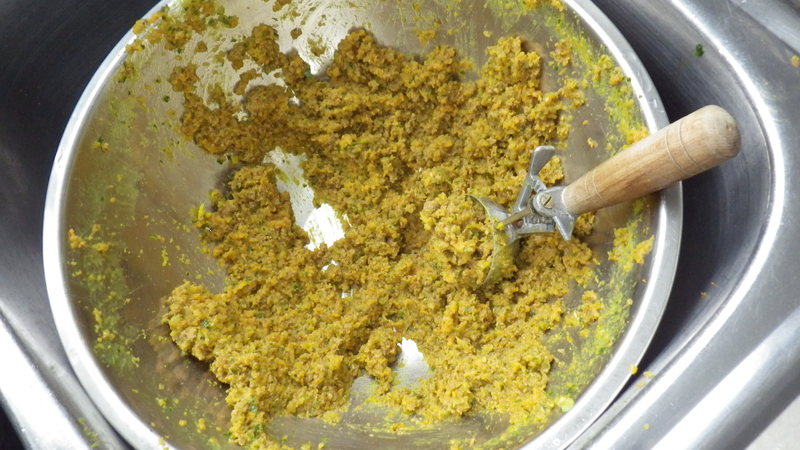 Pulse the mixture using the cutting blade (shown above) until you achieve your desired consistency. 6. Spoon mixture into resealable bags in appropriately-sized portions. TIP: Mitzie weighs 4lbs and gets two generously heaping tablespoons once a day. Be careful not to overfeed your dog! 7. Place each bag standing upright on a large cookie sheet. don’t stick together, and freeze overnight. We portion out the dog food using an ice cream scooper, and freeze them flat on a cookie sheet. 8. Remove bags from cookie sheet(s), and store in your freezer for up to 3 months. For Serving: Remove one bag the night before, and defrost in your refrigerator. 20 seconds to warm it up for your pup. Do you have a go to dog food recipe? I love hearing how other dog owners spoil their pets!